The Thylacoleo (thy-lah-ko-lee-oh) is one of the Creatures in ARK: Survival Evolved. 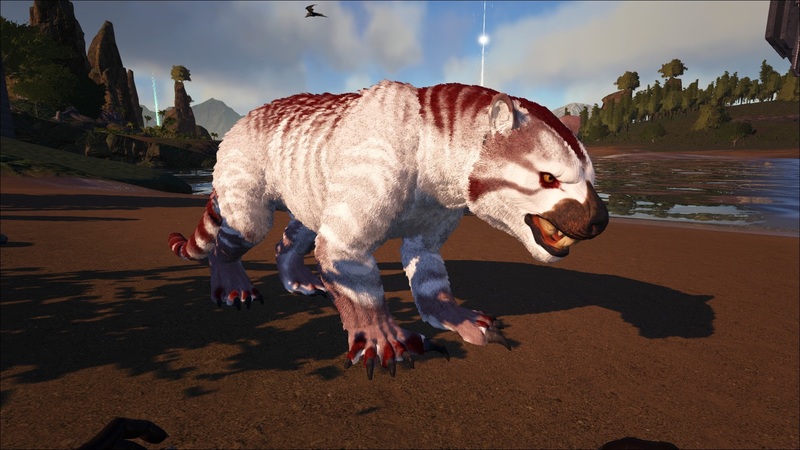 The Thylacoleo lives in the Redwoods on The Island, Ragnarok, and on The Center. In Scorched Earth the Thylacoleo spawns at the edges of the dunes and on low lying cliffs. On Ragnarok, it can also be found on the Rashaka Savannah islands alongside many Scorched Earth creatures. Thylacoleo furtimorsus is a large, powerful marsupial that can often be found hunting around trees among the Island's redwoods. Its long claws and semi-opposable digits make it an apt climber, a quality that Thylacoleo uses to its advantage while hunting. It clambers up large trees and waits to ambush passing prey by pouncing upon them. When something that large jumps onto a target, the victim becomes stunned and doesn't stand much of a chance. Thylacoleo's most notable fighting quality is its powerful jaws. Once it bites its prey, it locks its jaw in an iron grip that can hold most smaller creatures in place. Thylacoleo then goes on to savage its prey with its sharp claws. If it needs to escape from a fight, Thylacoleo uses its muscular hind legs to jump back to safety among the trees. Thylacoleo is a moderately strong mount, and its ability to climb trees and jump long distances makes it useful for traversal. As such, developing tribes often tame it. Small raiding parties particularly favor Thylacoleo, as it is well suited to ambushes and unfair fights! Thylacoleo often hides high in the redwood trees, faced down towards its prey. However it can only move up and down trees, cliffs or any other climbable surface. Upon entering aggro range, the Thylacoleo will leap from above, pinning any prey beneath its weight, even knocking players off of any mount. Also known as the "marsupial lion", Thylacoleo is a powerful pouched predator native to the island's towering redwood forests, pursuing a semi-arboreal lifestyle as it chambers and leaps between the trees. A strong bite - the strongest of any land mammal - and bolt cutter-like teeth make this creature a formidable ambush predator, leaping from above to crush the necks of its prey. This section displays the Thylacoleo's natural colors and regions. For demonstration, the regions below are colored red over an albino Thylacoleo. The colored squares shown underneath each region's description are the colors that the Thylacoleo will randomly spawn with to provide an overall range of its natural color scheme. Hover your cursor over a color to display its name and ID. 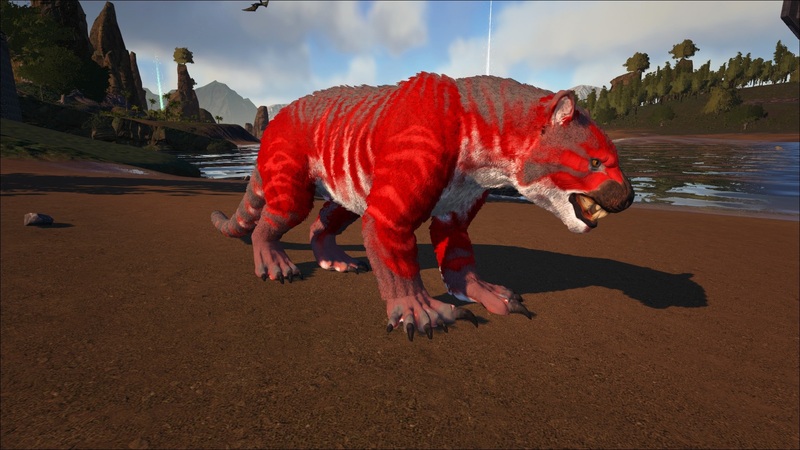 For example, "cheat SetTargetDinoColor 0 6" would color the Thylacoleo's "body" magenta. Thylacoleo seems to always be aggressive. If it is on the ground it will pursue the player only when really close. Its aggro range seems to be similar to the Therizinosaurus. The Thylacoleo spawns on the sides of trees ready to pounce on any unlucky creature should it come into this predator's pouncing range. Should a player be flying near it, the Thylacoleo will leap off the tree pulling you from your mount to the ground and holding onto you till death. If it's on the ground, it can be easily avoided. If the confrontation is inevitable, bait it out the tree and then kill it. It has the base health of a Spinosaurus and the damage of a Carno, so melee fights are best avoided unless the Thyla is low level. Similar to the Kaprosuchus, it is possible for the Thylacoleo to dismount the rider and pin them to the ground. Similar to the Megalosaurus, it is also possible for the Thylacoleo to pin the mount itself - taking the survivor for a ride, but not preventing them from dismounting. Pinned creatures are stunned and cannot retaliate, but pinned players are not. Creatures too large to be pinned will not be affected by the attack and, if the attack hits the creature, no ill effects are passed to the player (unlike the purlovia, which dismounts the player in all cases but only stuns the player if the player specifically is hit). It is a saving grace that Wild Thylacoleos are not particularly good at predicting movement, and thus fast targets are relatively safe. The Thylacoleo is strong and tough to confront. Shoot with tranquilizer darts from a high up rock. While flying, the Thylacoleo is very easy to spot if you are looking for it and is best avoided. It's best to use ranged weapons or combat mounts, as it has both high damage and health. Don't let it pin you into a corner as the high damage output can quickly destroy your armor and kill you. 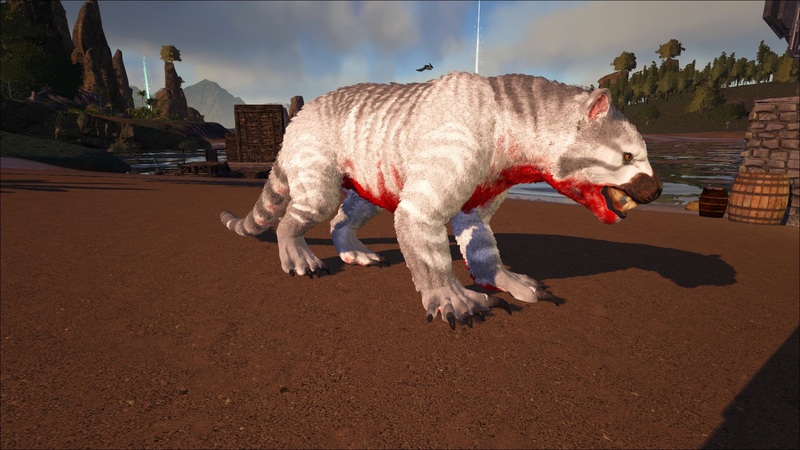 You can use a Quetzal or an Argentavis to grab a Thylacoleo right off the tree and render it harmless. Do not approach a Thylacoleo that is perched in a tree. It will knock you down if you are on a smaller flying mount including a pteranodon, argentavis, pelagornis or tapejara. Take advantage of their stationary position to get a free shot with a tranquilizer arrow or dart. Once on the ground, they are still rather fast and have relatively high torpor for their size. Ideally, use a Griffin, which allows you to use weapons while mounted and flying. Using a move-and-fire strategy, attack the Thylacoleo with ranged tranquilizing weapons from the air. Be careful not to drift under the Thylacoleo if shooting it while it is up a tree, and be aware of the possibility that more Thylacoleos may be lurking in nearby trees once you knock it to the ground. Use a Rex or another tank to soak up damage and then tranquilize it. If you are not high level or have strong tames and you meet one on flat ground, run and try to get it stuck if you can keep running or tranq it. On flat ground they are very fast and will decimate you swiftly. As with other medium-sized creatures, using an Argentavis, Quetzal or Wyvern to carry it, or using a fast mount to kite it, into a pen made out of materials it can't damage and then firing tranquilizers at it from windows or a high platform is also viable. If a Griffin is not available, this is the second-best option. Note that their torpor depletion rate is very high, about half that of a Quetzal. As such, it is important to keep them under the effects of the increase over time effect of ranged torpor weapons as you will quickly lose progress if you are unable to keep up the fire. This also gives arrows an advantage over darts as a single player will have to fire the rifle as fast as possible to prevent the torpor from depleting. War Mount: Its natural high health and good damage makes the Thylacoleo one of the (if not the) best medium-sized war mounts. Its climbing skill can be useful during raids to avoid outer walls and the pounce can make short work of smaller animals used as defense. Base Defense: Thylacoleo can be "parked" on base walls, where raiders won't usually expect a large predator. This makes it a very useful ambush animal. *Note, Thylacoleo will slowly lose stamina while clinging to the wall. When it doesn't have stamina, it will fall and take fall damage. All-Around Mount: good combat capabilities, ability to jump, good speed, very low stamina drain, vertical climbing and very high swimming speed make the Thyla a very useful mount for survivors who needs a "jack of all trades" mount. The Thylacoleo can climb vertical surfaces such as wall or Redwood trees by jumping at the surface and keeping the jump key held in the air. It will climb straight up the surface until it either encounters an obstacle, such as an overhang, successfully reaches the top and jumps over it, or the jump key is released. If the jump key is released while it is climbing, it will cling to the wall. While clinging to the wall, the player can not use mounted weaponry. The Thylacoleo can cling to the wall indefinitely, and will stay attached even if the player dismounts (although it can be brought back down with a whistle command). While mounted and attached to the wall, if the player rotates the camera down, the Thylacoleo will flip over and a targeting reticle will appear, indicating that the Thylacoleo is ready to pounce with the attack key (default lmb). If the pounce hits a valid target (listed below), it will immobilize them and the Thylacoleo will chew on them until the target dies or the player releases it with the secondary attack key (default rmb). The pounced target is unable to fight back, although the pounce itself may incur some fall damage. Do note that the pounce damage and mauling is NOT boosted by leveling up melee damage. It does decent damage (30 damage for the pounce, 40 per maul in a 3-attack sequence), but since the target can not fight back this isn't a major factor. Many players nearly got a heart attack while taming the Thylacoleo. Be cautious while taming these, they can give you quite a scare when they jump on you from trees. Thylacoleo has the ability to roar (press C). Despite looking like a lion or a very large rodent, Thylacoleo is a marsupial and more closely related to Australian kangaroos and koalas. Cannot be used in boss fights, because it is a climber. Despite being able to access the Rockwell Arena, it is unable to transfer to Aberration, rendering this ability nearly useless. Thylacoleo means "Pouch Lion" in Latin, referring to its nickname as the marsupial (pouch-bearing) lion. And the Thylacoleo furtimorsus roughly means "the stealth pouch lion". Relative to its body weight, Thylacoleo may have had one of the strongest biting forces of any land mammal to ever live. Thylacoleo has the ability to climb trees with some maneuverability, a unique new feature to ARK. Thylacoleos are often called "murder cats" or things best left unsaid due to their extreme lethality. The Thylacoleo can climb just about anything. Whilst in the climb position you are able to turn the camera around and gain a target reticle. With this you can pounce on an enemy and pin it much like the wild ones do. Leaving your Thylacoleo on a wall and on aggressive will make it pounce anything that comes by thus executing its maul attack. This feature is used well in their home in the redwood forests, but can also be used on mountains, buildings, and steep ledges. Ingame and according to the dossier, Thylacoleo is large enough to ride. This is inaccurate, as real Thylacoleos were only slightly larger than a jaguar. This is especially evident in its dossier and ingame model dwarfing the Sabertooth, whereas in real life Thylacoleo was only roughly half the size of. The size depicted in the dossier is closer to proborhyaena gigantea, a distant ancestral cousin to Thylacoleo. Thylacoleo, however, was much more agile, and sports a bite force that was, pound for pound, one of the strongest in the animal kingdom, so it's likely not a mistake on the developer's part. In fact the Thylacoleo is the only creature that prefers cooked meat over raw meat. The implementation of Thylacoleo as a fearsome giant marsupial that pounces on prey from the treetops may be inspired by the Australian stories of drop bears, a made-up marsupial designed to scare tourists. In fact, many news publications and some scientists have compared these extinct creatures to the Mythical 'drop bears'. Baby Thylacoleo reacts differently when they are imprinted after requesting for one as compared to leveling adult Thylacoleo up. This shares the same trait as Dire Bear. This page was last edited on 21 April 2019, at 08:44.